New Zealand's Gender Issues. 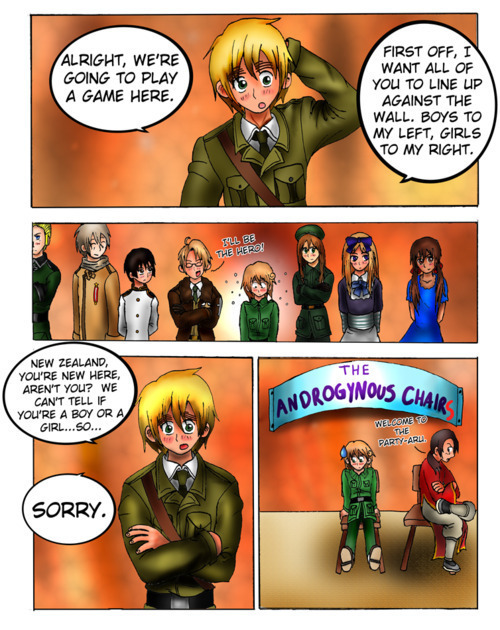 Look who's in the other chair.... Wallpaper and background images in the hetalia - axis powers club tagged: hetalia new zealand gender. This hetalia - axis powers photo contains anime, banda desenhada, manga, desenhos animados, mangá, and quadrinhos. There might also be jornal, papel, revista, tablóide, pano, and tabloide. ... He's a boy~! Comeon, if we're having issues with him, then why not with Finland as well? Their gender isn't official yet. And add Norway and Hong Kong while you're at it. Aww, poor New Zealand. (S)he needs a hug.